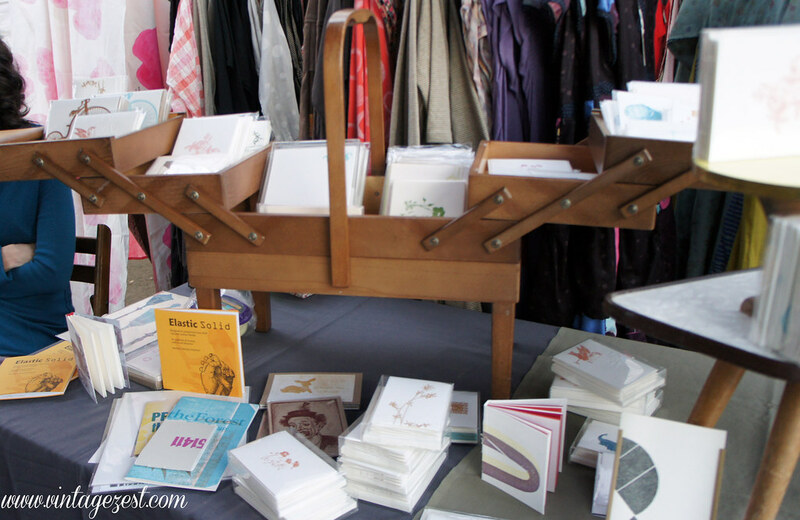 Handmade Gift Feature: Lettre Sauvage ~ Diane's Vintage Zest! 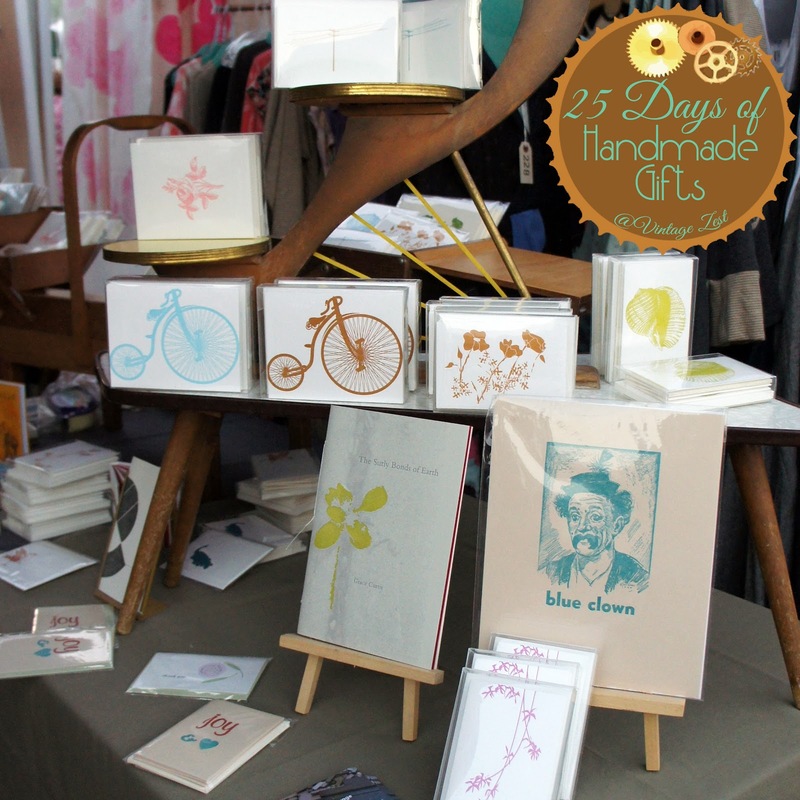 For today's "25 Days of Handmade Gifts" feature, I am featuring a special kind of gift. Not only does Lettre Sauvage make lovely cards, stationery sets, and journals... they offer printing classes on their authentic letterpress machine! I love, love, love the idea of giving an "experience" or lesson as a gift, especially for someone who loves creating and crafting. The vintage and hand-made enthusiast in me especially appreciates how this is a true old-fashioned process, with fantastic results. Read on for the details on Lettre Sauvage's beautiful products and how you can schedule a class time to make your own! Lettre Sauvage started around 2003, when we realized we had enough space cleared out in our garage and workshop to put in a few vintage letterpresses. Originally there were 3 of us Fiona Leggett, Cameron Leggett, and Genevieve Yue. 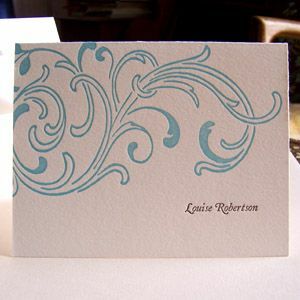 We've always made both books and stationery as well as done custom printing. 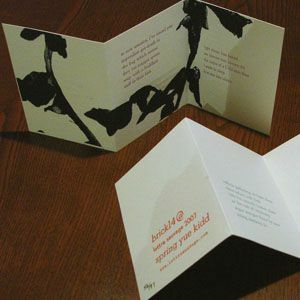 Fiona studied letterpress and book binding with Kitty Maryatt at Scripps College. Cameron always wanted to do real printing (as opposed to digital printing or offset printing) having worked at Kinko's with all things flat, digital, and virtual he sought out something a bit more tangible. Genevieve has moved on to become a professor of critical theory as it relates to cinema, but printing is still a common love we all share. Lettre Sauvage translates more specifically as Wild Letter. Sauvage being more akin to unruliness or being unkempt or uncivilized, in it's translation from French to English. The name sounds more vicious in English. We had an interest in the slogans of the Paris Student uprisings in May 1968, and while researching the printed output around this period, the idea of Lettre Sauvage was born and went on to become the company name. Why did you start making goods for Lettre Sauvage? We have always made both poetry books and stationery. For a short while we played with having a line of wedding stationery but let that evolve into part of our custom printing services. A connection to education and the community is important to us. We provide supervised access to our presses for those who might like to try printing, either as a history lesson with a group of kids, or as a social outing with the added benefit of having some stationery that you've actually printed at the end. Classes are actually our favorite, printing activity. There aren't many places that will let you use a vintage letterpress outside of a university setting, so we've had students referred to us from as far away Mexico and Arizona. It's a cliché, but our current project really is always the best. Of course our daughter Yma's book "The Even More" with her stories, games and jokes, from the ages between 3 and 5 is pretty high on the list. Everyone seems to love the card with the silhouette of telephone poles and wires. It has always sold well. Originally it had the text "missing you" underneath. People must relate to the sense of longing implied by the lines extending off to the horizon. Telephone poles are very emotional when you think about it. Inspiration is all around... we try to increase our perception of our immediate surroundings, and express the deeper meanings and connections that are implied or explicit within our shared perception. Uhm... Huh... I guess we just like to see meaning and inspiration everywhere especially in our own neighborhood, our home, our kitchen, our garbage disposal! We're trying to find subtle truths that everyone can relate to but not always in the same way. We love that can reach people and let them see a collection of actual items... "Things and Stuff are Great" as someone much cooler than me once said! However, what truly sets us apart from others is our willingness to let others be a part of the process, to provide access and guidance to the ideas and methods involved in putting real ink on real paper. The toughest part of letterpress printing is getting access to the machines themselves... after that it's just setting up the machines to run your job. All of our presses are hand fed, and it takes time and attention to get perfect registration, impression and inking, but once you've made all the mistakes and know what to look for the press becomes an extension of your body... a very heavy and powerful extension! Our custom printing isn't as cheap as some online stores, and we also take a bit longer. Also, we usually we insist on a design already being camera ready and suitable for letterpress... BUT if you're in our home studio we're more flexible. People want to become involved with the presses instinctively when they see them... that's exactly what happened to us! We all see the magic happening and then know that we're going to make something great. Prices vary on custom work since there are a lot dependencies that affect the cost, such as size, number of colors, and folding. We really recommend ordering before December 15th. Paper moves through the mail systems pretty quickly so that's a nice aspect of our business. As far as custom printing goes you'd want to get a project to us before December or not later than the first week of December.